Elsie is so silly. She loves to be bratty just to get our attention. She doesn’t enjoy good attention as much as she prefers us to try to get us to chase her. We don’t chase her, but that’s what she wants. 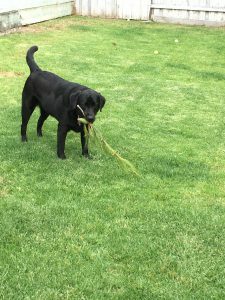 Someone told me to ‘trade’ her treats for things she brings in from outside, or things she steals, so she doesn’t run away from us – instead she just hands over the prized possession for a treat. It works really well, and she volunteers up whatever it is IF we give her a treat. Sometimes I think she wants a treat so she goes to find something so I will ‘trade’ her. Lately she has been bringing in large branches. She has a hard time bringing them in through the doggie door, but sometimes she manages to get the branches inside. Here is a picture of one she got the other day – it had 3 little pine cones on it, too! Bonus!! I let her keep that branch for a while – it looked like it was hard to get. Another silly thing she enjoys doing is trying to carry multiple toys at once. 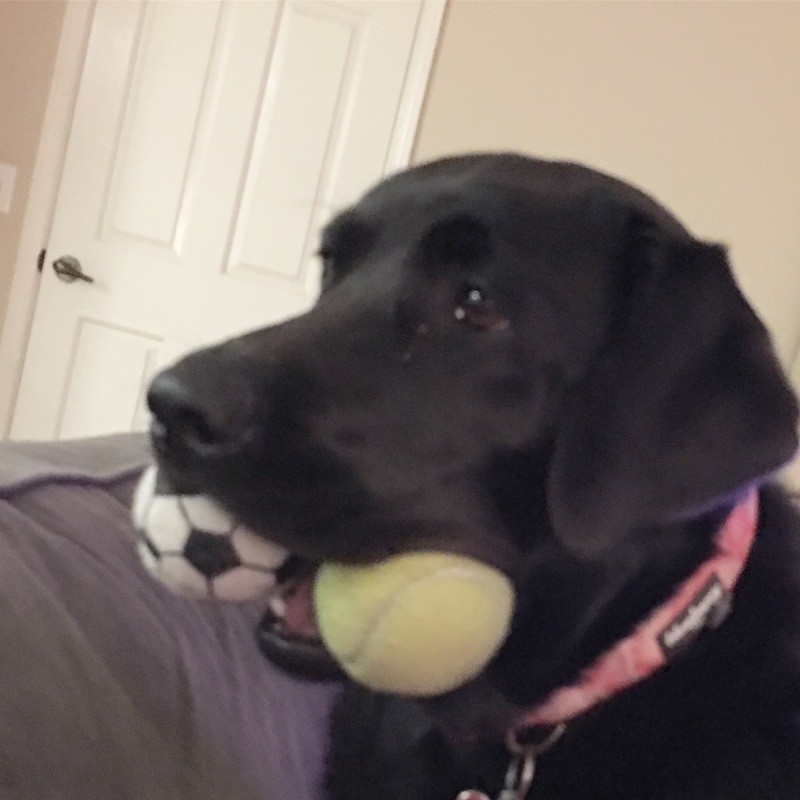 She will have one or two in her mouth, and then she will be kicking a tennis ball around with her feet. She is getting pretty great at dribbling the tennis ball (soccer style). Every time I try to video tape it, though, she stops! Elsie loves getting her picture taken, but not when she is concentrating on all the toys, I guess. She cracks me up! Owning a lab is fun. They have such great personalities and are always doing something silly. I love Elsie! Previous PostElsie is 1 year old now!Next PostElsie is on a doggy diet!